1. When Peco dominates the rich boy from out of town, Peco is depicted as a charming hero. The rich boy is shown as ignorant and arrogant, clearly deserving of punishment. When Peco slaps the harshness of reality in the face of the rich boy without even breaking a sweat, he cries out “What were my ten years for? !” — an almost cartoonishly funny exclamation. As the audience, we have almost no sympathy for the rich boy. 2. However, when Peco is himself the victim of Wen’ge’s incredible Ping Pong skills, the narrative takes on a drastically different tone. We see Peco try to assess the situation, trying to calculate Wen’ge’s movements, and even though he loses the first few points, we are under the impression that Peco is just testing the waters; sure, he may lose a few, but the information he’s obtaining will let him triumph over Wen’ge, just as the hero always does, right? When Wen’ge skunks Peco, Peco performs a dramatic dive from the top of the screen to the bottom, obviously symbolic of the completely humiliating loss of his heroic status. Peco does not even realize that this is the same fate that he was callously delivering to overconfident rich boys all along. But even so we are led to have sympathy for Peco, because we had rested all of our hopes on his shoulders. 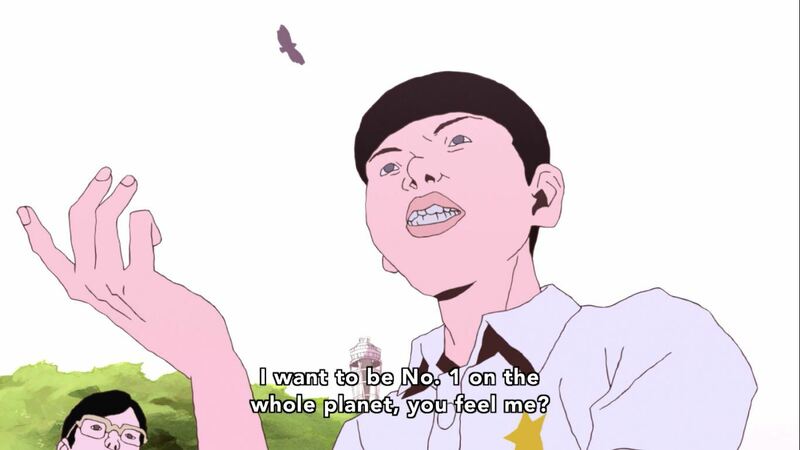 Wen’ge is depicted as distinctly unheroic; cocky, cold, and cruel, and not nearly as charming as Peco, and the juxaposition of these two personalities is clearly intentional. With the loss of Peco’s hero-status, our naive expectations of Ping Pong heroism have been completely — and permanently — annihiliated. Ultimately, we learn that the charismatic, gets-what-he-wants hero doesn’t really exist. A robotic arm extends itself to Smile, offering within its hands an alternate solution to a no-show hero. In a cruel and uncaring world, Smile must actualize the results of heroism by himself, and he needs to take action in life, not simply wait unendingly for a hero that will never come. Smile then presents us with an alternate definition of hero: not a likeable, charismatic personality, but a person capable of superhuman feats — someone who is unquestionably beyond human limitation. Smile imagines himself as a calculating robot, and in so doing, he channels an unbelievable strength and defeats the coach. Ironically, Smile remembers a quote from his old self: “I want to be just like you, Peco.” Prior to his awakening, Smile had always compared himself to the ideal of classical heroism. But now, Smile realizes that the stoic, logical, and almost cruel “robot” within him is an equally valid definition of hero that opposes classical ideas in almost every sense. Smile therefore transforms himself from an anti-hero, a completely unsympathetic and abnormal character with few redeeming qualities, to a real hero.